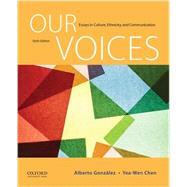 Our Voices: Essays in Culture, Ethnicity, and Communication examines intercultural communication through an array of cultural and personal perspectives, with each of its contributors writing a first-person account of his or her experiences in the real world. While most readers are collections of scholarly essays that describe intercultural communication, Our Voices presents short, student-oriented readings chosen with an eye toward engaging the reader. Collectively, the readings tackle the key areas of communication-rhetoric, mass communication, and interpersonal communication-using a uniquely expansive and humanist perspective that provides a voice to otherwise marginalized members of society. Praised by students for its abundance of short, first-person narratives, Our Voices traverses topics as diverse as queer identity, racial discourse, and codes of communication in nontraditional families. Chen identifies the cultural and global forces that influence naming in professional and family settings. Korn traces her growing understanding of and connection to her Thai heritage to the rise of the Internet and social media. Nakayama argues for the centrality of the Japanese American experience in the making of American culture and history. The authors describe how the centuries-old Osage naming ritual connects contemporary Osages to tribal identity. Tanno describes how each ethnic self-reference communicates a story and how multiple stories provide significance to an American identity. Parrish-Sprowl explains how a new cultural and professional identity is negotiated when he becomes hearing impaired. The authors explore the importance of co-creating safe spaces for speaking, using in-group language style, and social support in the construction of Black women's intracultural and intercultural friendships. Gangotena uses the concept of la familia to explore Mexican American family communication. Gong describes speech strategies used by Chinese from the Mississippi Delta. Hamlet explores how the rhetorical style of preachers in traditional black churches preserves the cultural identity of black communities. Ríos discusses the dual functions of mass media, online media and social media in Mexican American communities in Texas. In the 2008 film Slumdog Millionaire, U.S. audiences view representations of contemporary India. Rodrigues examines these representations in light of his interpersonal relationships. Shutiva challenges some of the stereotypes about Native Americans and discusses the role that humor plays in their culture. Nance and Foeman examine how public opposition to a sculpture honoring New York City firefighters reveals the uneasy state of race relations in the United States. An interview with Al-Mutawah, who responds to questions posed by U.S. students. Bowen explores the particular intersection of her Jewish upbringing and the feminism she adopted as an adult. Tyler Perry's representations of African American women in recent films are critically examined. James reflects on the meaning of blackness and black womanhood through family stories and personal experiences. The meaning of home and community for African American gay men is explored through poetry, song lyrics, and feminist and gay/lesbian theory. Shenoy-Packer describes her attempts to become accepted in the U.S. workplace while balancing new and often conflicting categories of identity. Weber describes the tensions and challenges that occur when Jewish identity is marked as unusual. González and Willis-Rivera examine the rhetorical opportunities and challenges that accompany annual ethnic celebrations. Fong discusses good luck expressed through speech and gift-giving practices that display goodwill and affection. Hegde describes how Hindu festivals inspire their participants despite outside efforts to limit "foreign" cultural gatherings. Gordon describes the creative "survival mechanisms" in Jamaican talk that privilege the local and counter the colonial. Hashem examines wastah as an effective Lebanese method of mediating conflicts and relationships. Scott examines misconceptions about black language use and explains how local ways of speaking are markers of identity and solidarity. Watts interprets the tensions that arise when popular culture takes the "N-word" from private in-house dialogues and distributes it in the easy-to-open package of hip-hop. Allen describes her interracial friendship with a lesbian colleague and how the two overcame sanctions against such a relationship. As white mothers of two adopted African American boys, Fine and Johnson examine the communication codes operating in the creation of their multiracial and "nontraditional" family. In exploring the biracial identities of her students, Harris comes to appreciate her own biracial heritage. Leonard reveals how social intolerance of racial ambiguity poses dilemmas and interpersonal challenges for multiethnic individuals. Engen invites readers to consider the ways in which America's working class can and should be considered a cultural community. Hendrix traces her journey from her "working poor" upbringing to "affluent class" lifestyle. Lawless explores the construction of "lower class" white identity in her personal and academic experiences. Wong(Lau) interprets the intertwining aspects of race, gender, and class as she recounts her coming of age in both Chinese immigrant and American university settings. Based on her extensive work with refugee communities in Africa and in the U.S., Mbula Mutua explores the question: How do we begin to understand the interactions between refugee and host communities? Tang reveals the complex balance of considerations faced by a small group of Chinese mothers in the U.S. South as they raise Chinese American children. Cheng describes the process of "documenting" transnational workers. Carrillo Rowe deconstructs immigration politics as she examines her family's migratory history. Lozano discusses assumptions about "public space" in Anglo-American and Latin American cultures. Lum discusses regional differences among Chinese communities in New York City and how ethnic identity is maintained. Growing up during the occupation of South Lebanon, Kahil experiences the "Thirty-Three Day War" between Hezbollah and Israel. * New or revised for this edition.